AllLookSame - China, Japan, Korea: What’s the difference? A friend asked me what I thought about this essay written by a Korean American college student, entitled “Transformed Into White Gods: What Happens in America Without Love”. This is a relatively common sentiment among Asian Americans. I heard plenty of it when I went to speak about AllLookSame.com to a community of Asian American students and alumni at Harvard back in 2002. I can certainly understand the pain, but I cannot relate to it. Not that I’ve never had this type of feelings, but that I cannot justify thinking about those feelings in this way. I believe this way of thinking about race reinforces the idea of white supremacy. We humans exhibit this type of love and hate only when we have a deeply psychological attachment to something. Just think of anyone addicted to anything. We allow our objects of attachment to have power over us by being in that relationship. Drug addicts either love or hate their drugs; they have no choice of being neutral. Also, this type of sentiment can come only from those who grew up assuming that life should be fair. You might say, “But life SHOULD BE fair!” But there is a big difference between thinking that it would be ideal if life were fair, and expecting that life has to be fair. Imagine what it would be like to be born with a genetic disease that cripples you, and gets increasingly worse over time. With a handicap like that, you cannot expect your life to be fair. Just because other college kids are walking around the town with their friends to various bars and having fun, it does not mean that you should be able to. Yes, it would be amazing, if you could, but unfortunately it’s not possible for you. If you were to insist that life should be fair, you would need to demand that other people stop walking and stop going to bars and have fun. You would just become increasingly bitter about your own predicament. And, furthermore, unlike Asian vs White, there is no easy conceptual target to attack and blame your misfortune on. Even among whites, we have people who look like George Costanza on one hand and George Clooney on the other. People who look like Clooney have a significant advantage over those who look like Costanza. Unfortunately, that is the reality we have today. There are plenty of white people who look even uglier or more pathetic than Costanza. It’s hard to say if being an Asian man who look like Jet Lee is better or worse. Race is just one of many factors that makes life unfair. And, it’s an easier form of unfairness to cope with because it is a conceptual framework that is easily understood by everyone and is already culturally recognized as a factor that contributes to unfairness in life. So, getting sympathy for it is a lot easier than, say, for some obscure genetic disease. It would be great if life was fair, but it’s not. This does not mean that we should all accept the unfairness and do nothing about it. We should strive to make our society fairer, but the key question is our expectations. From time to time, all of us have probably wished we looked better, and felt envious of our friends who are better looking than we are. If you were to expect that you should look as good as your best looking friend, you would naturally feel bitter, and your friendship would probably fall apart. Your great looking friend didn’t do anything to you. He too was just born that way. It’s not like he cheated somehow to get the better looking genes. So, expecting that you should look as good as he does has negative impacts, not only on the society but also on yourself. This is what happens generally when you fight against anything out of anger. It’s not that you have no justification for fighting; the real problem is that your efforts only make the situation worse, not just for others, but for yourself also. To fight racism effectively, you need to be able to detach yourself from the concept of race first. If you are helplessly attached to it, you wouldn’t be able to fight it effectively. You might just spiral down the vicious circle of love and hate, like many drug addicts do. “What’s your midde initial?” adults would demand as they filled out my forms. “Y,” I would mutter, staring sullenly at the counter I was too short to see over. As a middle child of the 60s growing up in rural Maine, a state that is still 96% full of 100% Caucasians, I would get this look a lot from librarians that couldn’t figure out what to do with a five-year-old with a reading list. These books were written in the language of Sunday school, because my Korean immigrant father was the pastor of a Methodist church with an all-white congregation, and it was important to blend in by speaking excellent English. I love this whole “Ken Tanaka” character. Very nice calligraphy for the title. I love this “How to cook Traditional Japanese Passover and Easter recipes” too. I recently came across this expression, “Asian glow” or “Asian blush”, and a new supplement called “NoGlo” that prevents it. And, last night, I went to see the opening of the show at Guggenheim Museum featuring a Japanese art collective called Gutai (which, by the way, was quite interesting, but that’s another story), and they had a full bar open to all the guests which naturally included a lot of Asian people. Sure enough, I saw some of their faces glowing red. We want to believe that race is just a superficial difference but there are certain characteristics that are clearly different by race. Asians are less tolerant of alcohol, and I have been wondering why. I figure evolution must have something to do with it. I also came cross this article about alcohol reducing the risk of food poisoning, which I had assumed was an urban myth, but it is apparently true; drinking alcohol can kill bacteria in our stomach. This made me ask: Would it be possible that we evolved to like drinking alcohol because those who liked it had a higher rate of survival? That is, the fact that it can kill bacteria is not a fringe benefit, but is the main reason why we developed a taste for it. In other words, those who happen to think alcohol tastes good had a higher rate of survival, so they were more likely to pass on their genes, and their offsprings would share the same taste for alcohol. Perhaps at the beginning of human history, not many people liked alcohol but they were eliminated through food poisoning, and the rest of us survived because we like the taste of alcohol. I contacted Dr. Hanson who wrote the article referrenced above and asked about this, and he agreed that alcohol does provide a benefit for natural selection. Now back to Asian glow: Why would Asians fall behind in this department? Is it possible that Asians had more advanced knowledge in preventing food contamination? Or, were they generally cleaner? Or, did they have better techniques for preserving food? If you have any theories, please share with me. Famous Asians: Chinese, Japanese or Korean? When I first created AllLookSame.com, I thought about using famous people in the quiz but I figured it would be too easy. This video proves me wrong. I’m shocked that some people think Kim Jong-il is Japanese. That could be a serious PR/diplomatic problem if some people think all those threats of nuclear testing are coming from Japan! Yesterday, on my way home, I saw a Chinese lady carrying four bags of mooncakes and realized that it is now the season for them; Mid-Autumn Festival, which is apparently today (September 30) according to Wikipedia. From what I read on the Web, mooncakes are so labor-intensive that most people do not bother making them at home. I asked several of my Chinese friends and they told me to get the ones sold in a box at Chinese supermarkets. Last night, I went back out to Chinatown to look for them. A teacher at my daughter’s school told me that Fuxiangyuan is a good brand to get, so I went to about a dozen different bakeries and supermarkets to find it. I finally found it at New York Mart at 128 Mott Street. I was so excited to find it that I didn’t pay attention to the flavor indicated on the side of the box, and I ended up getting a mixed nuts version (Photo B: $20 per box of 4), which is not the traditional kind. On the way back home, I also bought one from Natalie Bakery on Grand Street at Forsyth (Photo A: $5 each). They make their own. This morning, another friend told me to go to Golden Fung Wong Bakery Shop on Mott Street at Pell Street. They too make their own mooncakes and they have many different kinds. I got the traditional one with lotus seed paste and egg yolks (photo C: $4 each). I went back to New York Mart to get the traditional kind but it was already sold out. In fact, I noticed that everyone sold out of all the imported mooncakes with lotus seed paste and egg yolks. The only ones I could find were ones with untraditional flavors, ones made elsewhere like Malaysia, or ones made by local bakeries. The expensive ones sold out first. My family happened to go near Flushing, Queens today, so we went to Hong Kong Supermarket on Main Street. When we got there, there were still about a dozen boxes available (Photo D: $11 per box of 4). As I was inspecting it, they were flying off the shelf, and by the time we left, they were all gone. Since I’m not familiar with the flavors of lotus seed paste and salted duck eggs, I can’t judge which one was the best, but I personally preferred the one from Golden Fung Wong (Photo C). I liked the saltiness of the egg yolk combined with the sweetness of the lotus seed paste. These should be eaten with a cup of tea. It’s essentially a way to sweeten the tea without actually putting sugar in the tea. As you can see from the photos, the imported ones look the best. I saw many other house-made ones, and none of them looked as good as the imported ones. 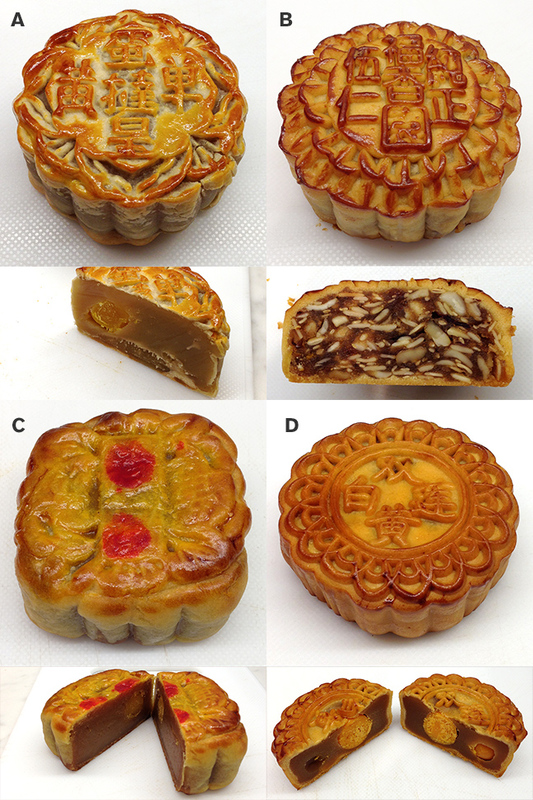 On the Web, I found mooncakes made by Starbucks. They look/sound great. I’d love to try them. And, apparently Häagen-Dazs makes mooncake ice cream.